We loved this recipe from Mel's Kitchen Cafe! (original recipe here) It took a little more prep work than I am willing to do every night but it was well worth it. We had plenty of leftovers for me to have for lunches the next couple days :-). Scoop out the center of each zucchini, discarding the seeds and leaving the outer zucchini flesh about 1/4-inch thick, forming little zucchini boats. Sprinkle the cut side of each zucchini with a little bit of salt (a pinch for each zucchini half). Set aside while preparing the filling. In a large, 12-inch nonstick skillet, cook the ground turkey or beef over medium heat with the salt and pepper, breaking the meat into little pieces as it cooks. Once cooked all the way through, drain any excess grease, except for 1-2 teaspoons, and scrape the meat to a plate. Return the skillet to medium heat and add the onion, garlic and jalapeno. Cook the mixture until the onion has softened and turned translucent, 4-5 minutes. Stir in the tomato sauce, chili powder, cumin, sugar, oregano, and coriander. Bring the mixture to a simmer and cook for 5 minutes. Lightly grease a 9X13-inch baking pan with nonstick cooking spray. Ladle in about 1/3 cup of the sauce and spread across the bottom of the pan. Stir the cooked meat and beans into the remaining sauce in the skillet. 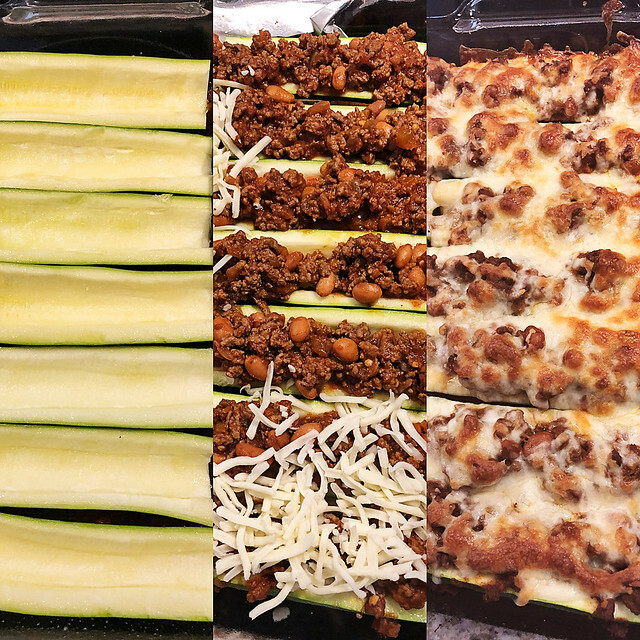 Scoop an even amount of the meat and sauce mixture into each zucchini boat, piling it on. Cover the baking dish with a layer of lightly greased foil and bake for 15 minutes. Uncover and layer the cheese over the top. Bake for about 20 minutes more until the zucchini is fork tender. Sprinkle the chopped cilantro on top and let the zucchini enchilada boats rest for 5 minutes before serving.